These are sold in a case of 1,200 (12 boxes of 100 each) for $46.61 which works out to about 4 cents a bandage. The have "Long lasting adhesive. 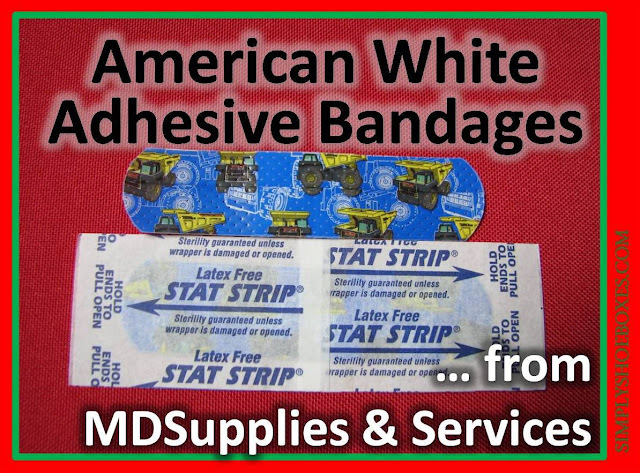 Comes with the preferred and patented Stat Strip easy opening wrapper that nurses request." They are very bright and colorful! I stuck one on my arm and it wasn't too painful to get off. I'm not too sure how well it would stick for a long-term use, but certainly fun! I hope this review helps someone...if you have any further questions, please just ask and you may want to check out the rest of my MD Supplies & Services Reviews. They offer many bulk options for hygiene items perfect for Operation Christmas Child shoeboxes.